Inspiring healthy living and well-being through food, fitness and faith. I can’t believe Easter is just around the corner. It sure seems like Lent only began yesterday. This year during Lent I really tried to focus on not only making sacrifices, which yes I am human and messed up on my Lenton promises here and there, but deepening my faith as well. One thing I have realized this Lent is that God is calling me to exercise my faith and commit to making it a priority in my life. 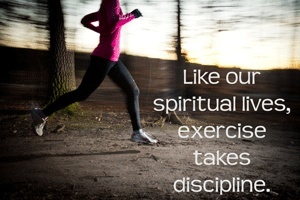 Just like my exercise routines, I need to put the same discipline and commitment into practicing my faith. I preach a lot about scheduling your work outs like an appointment and making it a priority in your daily routine, but I am now understanding that the same must apply to my faith as well. Just as a marathon runner has to create a training schedule and a plan to build up to the big 26.2 race, you have to create the same self discipline with your faith and spend time with God everyday for your faith to grow. If a marathon runner were to show up on race day without having any training, he or she would undoubtedly struggle through the entire race and likely not finish it. And the same applies to our faith. If we ignore God and go about our daily lives without investing time in Him, the moment we hit a rough patch in life we will feel like we are fish gasping for air out of water. You see God wants us to be present with Him everyday and turn to him in good times and in bad. I think for most people, and I am guilty of this too, it is so easy to let your faith stand still when everything seems to be going so well in your life and the moment the going gets tough you feel like the rug has been pulled out from under you. Which usually leaves you crawling desperately to God for help. Like the self discipline of a marathon runner, by practicing your faith every day you will become spiritual strong and able to handle any hurdle or pothole that appears in your path. By adopting the same outlook you have on your fitness and physical health with your faith, you can become stronger and find a sense of peace that may have been missing in your life. A marathon runner can’t expect to get in shape in one day and you can’t expect the same of your faith either. I am learning that I have to work at it everyday and I will likely make mistakes along the way, but if I commit to making my faith a priority I know I will come out a stronger, wiser and more peaceful person that can weather any storm. So I challenge you to exercise your faith the same way as you do your fitness routines. It takes work, but I believe it will leave you feeling lighter (mentally and physically), knowing that you are not in this world alone and that there is a greater purpose as to why certain things happen in your life. A colleague of mine gave me this wonderful book, Jesus In Calling, that is filled with daily passages and has become one of the biggest blessings in my life. I was skeptical at first, but she told me it really helped her to focus on a particular message each day. It is crazy how each passage seems to speak to exactly what I am feeling that day and are the exact words I need to read. I have many family members and friends that have found this book to be extremely helpful and inspiring. I am off to sunny Turks & Caicos for the next 5 days, but will be back with lots of fun pictures and tips for staying healthy when traveling and on vacation. In the meantime, enjoy a guest blog post later this week from one of my best pals,Julie. This entry was posted in Faith, Uncategorized and tagged Faith, Lent, spiritual journey by find your healthy haven. Bookmark the permalink.